SINGAPORE - Seven passengers were injured when a bus crashed into a traffic light in Toa Payoh on Tuesday morning. The Singapore Civil Defence Force (SCDF) was alerted to the accident at the junction of Toa Payoh Lorong 7 and Toa Payoh East at around 6.20am. Two ambulances took seven people - four women and three men - to Tan Tock Seng Hospital, SCDF said. It is understood that the SBS bus, service 238, was carrying about 30 passengers at the time of the accident. Ms Lee, 68, told Shin Min Daily News that she and an elderly man were flung to the front of the bus. She was bruised on her neck, left arm and leg, while blood flowed down the older man's face, she said. The man appeared dazed, and a maid accompanying him helped him put on an oxygen mask, Shin Min reported. One of the woman passengers suffered a cut on her forehead which required three stitches. The woman in her thirties said she hit a grab pole. Shin Min reported that two other women had broken bones. 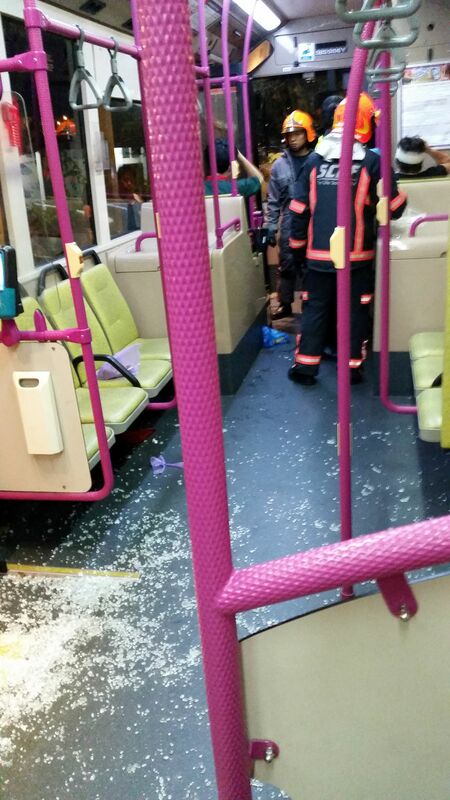 When contacted, SBS Transit apologised for the accident, and said they had sent officers to the hospital to help the injured passengers. "We are already in touch with the family of most of the injured commuters. We would like to apologise to affected passengers for the distress and inconvenience caused,"said Ms Tammy Tan, senior vice-president of corporate communications. She added that SBS is investigating the cause of the accident.